Unfortunately, the terrific cast isn’t given much to work with and leaves the viewer feeling a bit let down at the end. This is one Downey, Jr. film I don’t need to see more than once. When Big City Attorney Henry Palmer (Robert Downey, Jr.; Iron man, Sherlock Holmes) finds himself traveling back to his small, Indiana hometown to attend his mother's funeral, he can't make plans to leave fast enough. But when his overbearing, self-righteous father (Robert Duvall; The Godfather, Jack Reacher) is accused of murder, Henry battles his own demons to stay and defend the man who alienated him so many years ago. Coming to Blu-ray and DVD on January 27, 2015, The Judge is Warner Brothers' newest "family in crisis" movie. Like so many other films of the same theme, The Judge, isn't much of a surprise. It's full of clichéd family drama, a tumultuous father/son relationship, a lost love that still lives in the same small town and a lead character who finds new insights into himself and those around him. Unfortunately, this version "doesn't stand out among the crowd". The draws of this film are Downy, Jr. and Duvall -seasoned actors who take complicated roles and flesh out their characters. These two make Henry Palmer and Joseph "the Judge" Palmer, respectively, likable even though they are less than lovable men. They play their parts with the necessary nuances required of hardened men with flaws with soft, vulnerable underbellies. Downey, Jr. is a little less enthralling than Duvall, playing much of the same arrogant personality as his Iron Man character. The slight difference between Stark and Palmer is that Palmer shows more vulnerability and has moments of "lost little boy" innocence where Stark just acts like a jerk most of the time. Duvall is superb as the Judge - a hard-nosed, fair, individual who doesn't tolerate any excuses. Alternately, he is tender, sad melancholy and just a little defeated as a man who just lost his wife while battling a debilitating illness. Duvall, once again shows us why he is one of our finest actors. The supporting cast do a fine job but don't offer any outstanding or scene stealing moments. Vincent D'Onofrio (Law and Order: Criminal Intent) has a few good scenes as he portrays the older brother whose Major League Baseball career was dashed by injury. There is something almost tragic about his character and he plays it well. Jeremy Strong (Zero Dark Thirty) plays Dale Palmer, the youngest sibling with mental disabilities who breaks things down to its most simple denominator. He doesn't add much to the movie and his "sub plot" is actually rather distracting. The Biggest disappointment is Vera Farmiga (Bates Motel) as Hank's lost love from childhood. Her presences tends to complicate an already muddy plot and doesn't add much to the film. Add to that there is ZERO chemistry between Farmiga and Downey, Jr. and their scenes are painful to watch. Sadly, the plot of The Judge has been played out before and the screenplay has too many storylines to fully flesh out any of them. Had the writers chosen to simplify the story and focused on one or two characters is could have been a much better film. The Blu -ray extras leave a lot to be desired. There is a sit down interview with the cast in what looks like an apartment in NYC that underwhelms and the other extras add nothing and aren't interesting. The 1080p video is standard but the bicycle scene looks likes parts of it were green screened and done poorly. The audio is also standard fare and is certainly adequate. Unfortunately, the terrific cast isn't given much to work with and leaves the viewer feeling a bit let down at the end. This is one Downey, Jr. film I don't need to see more than once. 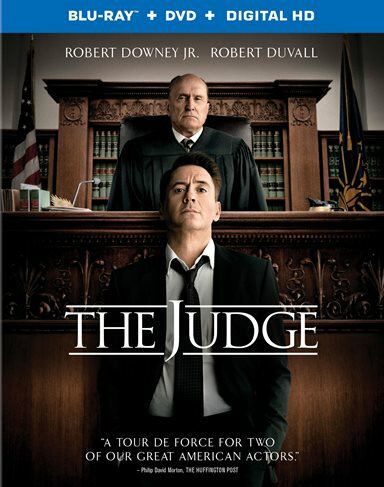 Download The Judge from the iTunes Store in Digial HD. For more information about The Judge visit the FlickDirect Movie Database.